A microphone is a device that converts a sound wave to an electrical signal. But it turns out there are quite a few ways of going about this magical task, each of which defines a type of microphone. Here are four of the most common. Dynamic mics are easy to build since they work on a simple principle (electromagnetic induction). This makes them inexpensive. They are robust, resisting shock and water, and are dependable over time. Finally, they can take high volumes without a problem. For these reasons they find a lot of use at live gigs or anywhere else these qualities are important. Condenser is another word for capacitor, which defines the key component of this type of microphone. Because a capacitor requires a charge to function, condenser mics (unlike the dynamic) need to be powered. These mics vary from inexpensive to costly, but have sonic benefits compared with dynamic mics. For one, they have greater efficiency, so they produce a louder sound from a quieter signal. This translates into less noise. They also have a more nuanced sound, with greater fidelity to the source signal. On the down-side they are more prone to handling noise, shock, and damage. For this reason they often find their home in the recording studio, where their environment can be carefully controlled, and where their timbral superiority is likely to be a decisive advantage. An electret microphone (sometimes called a pre-polarised condenser) is a type of condenser that incorporates a permanently charged material, so that it requires less external power to function. They are easy to make in quantity and hence are very inexpensive, with the additional bonus of miniaturisation. The mics in your computer, mobile, and other devices are all electrets. This is not to say that an electret must be cheap and nasty. They are also found in many studio situations. The most expensive electrets can rival polarized condensers in quality. In order to distinguish those condensers that are not electrets, the term DC-biased condenser is sometimes used. Other types of microphones (carbon, ribbon, etc.) have even more specialised usage, and you are unlikely to find them used on location. One specialised configuration worth mentioning is the boundary microphone, which is comprised of a condenser and a flat panel situated in such a way that the panel acts as an amplifier, extending the reach of the mic out into that particular horizontal plane. These are useful whenever one wishes to inconspicuously record from a flat surface. Examples include conference room tables, on stage during theatrical presentations, or at sporting events for capturing decisive events (e.g. on the back panel of a basketball hoop). Microphones are not equally sensitive to sounds from all directions. 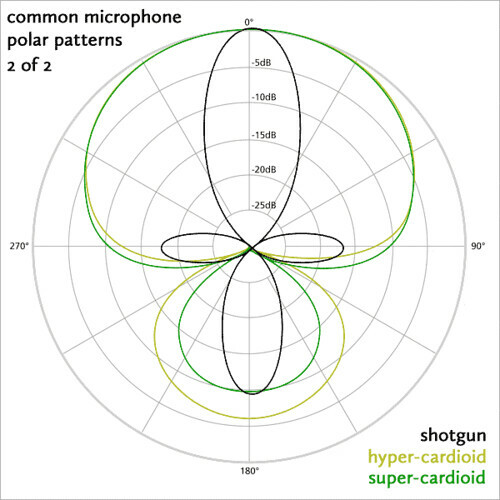 If you plot how loud a sound is received at different angles around the microphone capsule, you end up with a polar pattern. Here are the most important. An omnidirectional (or "omni") mic picks up sounds equally from all directions, or at least does so at low frequencies. At higher frequencies the size of the microphone itself becomes a factor, and sounds from the axis of the body will be diminished. 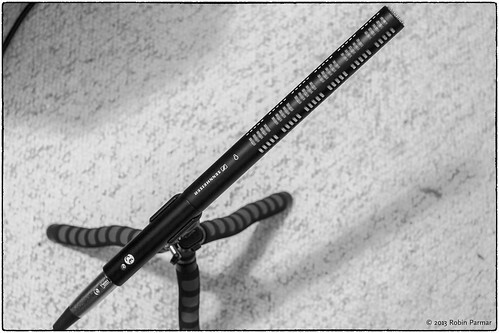 Omni mics are the simplest to design and tend to have less noise than other patterns. Omni condensers are also less sensitive to handling noise than other condensers. Furthermore, they tend to have greater frequency fidelity. These are all reasons to prefer them, but sometimes other patterns are simply more practical. A figure eight (or bidirectional) microphone does what it says on the tin, recording sounds equally from front and back, but with a dead zone (node) in the middle. These are particularly useful in mid-side recording (which I will say nothing more about here). 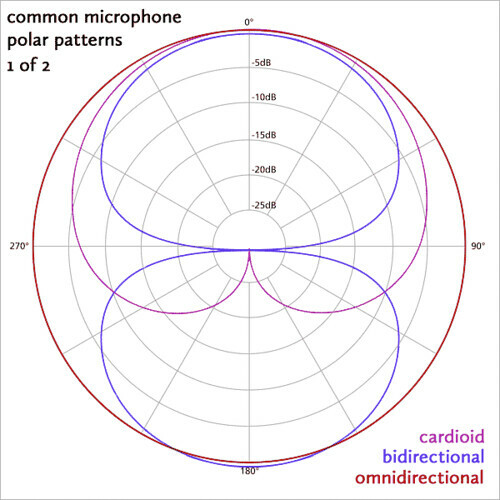 A cardioid mic gathers sounds from one side only, or, more precisely, in a pattern that looks rather like a heart (hence the name). These are useful on stage, where it is important to reject "bleed", that is, sounds from sources other than the desired subject. In the case of amplified gigs, cardioids can also reduce the risk of feedback, especially if using on-stage monitors. A hypercardioid has less pick-up from the sides but more from the rear. A supercardioid is slightly more directional again. A shotgun has by far the most directional pattern, but even here there are different degrees ("short", "long"). In all cases it's best to look at the published specifications, in order to examine the actual polar pattern of the model in question, especially so you can compare how this varies at different frequencies. The terms described above are only approximations. A very practical concern for a recordist is how to power a microphone. Different models of digital recorders provide different options. Some models of microphones are particularly picky about the power they get. Furthermore, power requirements constrain what cabling and connectors are appropriate, restricting which devices can be linked together. But do not despair! The situation is rather easily summarised under four headings. No power You will recall that dynamic microphones do not require power. Easy! Plug them into anything and they will work. Use any type of cable that is compatible with the audio signal. This could well be the thin 3.5mm (eighth-inch) cabling used on consumer and semi-pro gear. Such cable provides compatibility with even the least expensive recorder. Or it could be single-strand quarter-inch instrument cable, like what you'd use for an electric guitar or keyboard. Phantom power This is a formal specification that calls the delivery of 48V over two lines of a cable. Since we also need a line for the audio signal, a three-line cable terminated in XLR connectors has become the standard microphone cable. 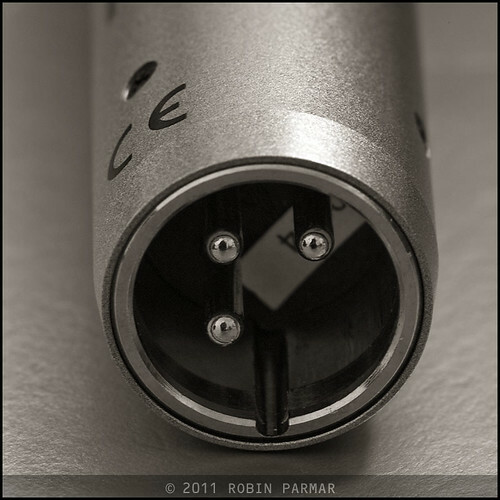 You can easily recognise the three pins or three sockets of XLR (picture below). Because the power is balanced over the two lines, it is not visible to microphones that do not need it... hence it is "phantom". This is a happy situation because it means that dynamic mics can easily use the same XLR cabling with no worries. You also need to know exactly what your microphone requires, since one mic might happily run off 10V while another needs the full 48V. Even more subtle, some microphones might indeed work while supplied with a lesser voltage than they like... but their self-noise might be higher, distortion greater, or sensitivity lower. You might well be using an expensive microphone with high specifications but only getting the audio quality of a lesser unit. Proper power is important! If you know anything about power you will recognise that not only the voltage but also the current must be specified. This is where things get tricky. The original phantom specification called for only 2mA, but the latest spec calls for five times as much current to be available. So if you have an old mixing desk, it might only deliver a trickle of current compared to what some contemporary mics need. More to the point, portable recorders that don't meet this spec will not support the full range of microphones that are available, some few of which do indeed require 10mA. This is not the end of the world, since you can avoid demanding microphones and still have hundreds of models to choose from. The problem is that manufacturers do not provide this vital information on their spec sheets! Plug-In Power Electrets don't need much power and have become almost ubiquitous. As a result, consumer devices (computers, MiniDisc, digital recorders, etc.) often supply what is called Plug-In Power (PIP). This is only 3-5V and less than 1mA. It can be delivered over a simple two line cable, since it is not balanced -- there is no need with such a small current. The standard consumer cable is 3.5mm diameter with tip-ring connectors. This is the same connector that a stereo cable would use, but in this case the signal is mono and the other line is for the power. Note that since the cable is not balanced, it should only be used for relatively short runs, to prevent the signal from degrading. PIP is advantageous when you want a compact and inexpensive recording setup. It permits longer recording times since battery drain is far less. Some condensers can be run off batteries in the microphones themselves. This completely frees them from the power capabilities of the recorder. The battery type and life will vary. Since it is an electret, Sennheiser has cleverly designed the ME66 to work using either phantom power (12V or more), or a common 1.5V AA battery. A switch turns the battery on, and momentarily lights an LED to reassure us that the battery still has juice. The microphone terminates in XLR, so that it can be connected to a phantom cable. In addition, an XLR to 3.5mm adapter cable allows the mic to connect directly to a consumer recorder. You might wonder why Sennheiser didn't forgo the battery and simply design the mic to run off PIP. The answer is that the lower PIP current would not support this microphone's excellent specifications -- which are as good as most DC-biased shotguns. According to user reports, running on battery power increases microphone noise above 8 kHz, but I consider that a fair trade-off for this sort of flexibility. I don't do a lot of recording that requires a directional mic, but when I do, it's nice to be able to run the ME66 from my pocket-sized recorders. If you own a digital recorder with phantom power you can use any microphones you wish, providing the recorder conforms to the full specification of 48V and 10mA. If it does not, you will be limited in which DC-biased condenser microphones you can use. Do your research to avoid disappointment! On the other hand, if you own a pocket recorder without phantom power, it will instead support PIP. You will be able to use either dynamics, electrets, or those microphones with their own battery power. In order to use a microphone with phantom power, you will need to purchase an external phantom power device, with the corresponding bulk and extra cabling requirements. Though this arrangement may have made sense some years ago, with the products available today I can't see any real advantage. It's better to buy a recorder with phantom in the first place. That's what I did. I have a small PIP recorder I can take anywhere with me, and a larger over-the-shoulder recorder with phantom power. I can now choose which I take into the field, depending on which microphones I need to use. And that is what I will address in the third part of this series: choosing the correct microphone for the task.